Facebook CEO Mark Zuckerberg appeared before American politicians on Tuesday as senators interrogated him over Facebook's role in the Cambridge Analytica scandal, which saw 87 million users' data privacy breached, as well as the extent of alleged Russian interference in the country's 2016 presidential election. 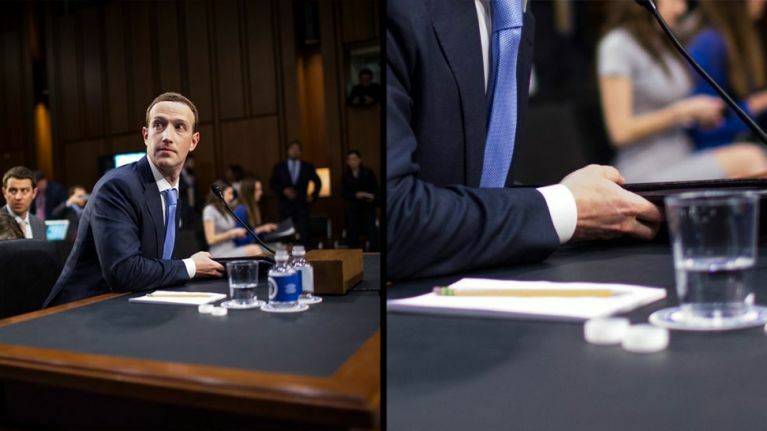 It was a polished performance by the Zuck, apart from one particular question. Facebook's share prices were up 5% by the first break in proceedings (thereby adding a cool $3bn to his personal wealth) and the CEO went home unscathed. The internal mechanics of his rigorous planning and practice were revealed when a reporter papped Zuckerberg's talking points. The notes provide specific question/answer responses as well as explicit instruction on what not to say (see full details below). There are also five whole bullet points allocated to Tim Cook, the CEO of Apple, which include the zinging "Lot's of stories about apps misusing Apple data, never seen Apple notify people - important you hold people to the same standard". People who used app gave Kogan FB information like public profile, page likes, friend list + birthday; same for friends' whose settings allowed sharing. NO credit card/SSN info. Confirmed they had - now seems untrue. Should have done more to audit + tell people. Important issue, but no credit card information or SSN shared. People Kogan access to Facebook information like their public profile, page likes, friend list + birthday; same for friends' whose settings allowed sharing. 2014 changes mean it couldn't happen now, restricted apps' access to data even further. Useful to find someone by phone number/email; if people have the same number. Fire people for CA? : It's about we designed the platform. That was my responsibility. Not going to throw people under the bus. Do you ever fire anyone? : Yes, hold people accountable all the time; not going to go into specifics. Resign? : Founded Facebook. My decisions. I made mistakes. Big challenge, but we've solved problems before, going to solve this one. Already taking action. Giving people more controls; just yesterday started showing people their app controls. Want FB to a service everyone can use, has to be free, can only do that with ads. Key for me is mission - helping people connect. Business model supports that mission. Let's be clear [obscured] Facebook doesn't sell data. You own your information. We give you controls. People know [obscured] need ads; tell us if they have to see ads, want them to be relevant. Families reconnected, people met and gotten married, movements organised, tens of millions of SMBs now have better tools to grow and create jobs. Bezos: "Companies that work hard to charge you more and companies that work hard to charge you less." At FB, we try to charge you less. In fact, we're free. [On data, we're similar. When you install an app on your iPhone, you give it access to some information, just like when you login with FB. Lot's of stories about apps misusing Apple data, never seen Apple notify people. It's very disturbing; and sadly we do see bad things on Facebook. Will never be perfect, but making huge investments. To slow, making progress. France, Germany, Alabama. Midterms are important, but not just in the US - Brazil, Mexico, Hungary. Silicon Valley has a problem, and Facebook is a part of that problem. Small part of ad market: advertisers have choices too - $650 billion market, we have 6%. Break up FB? : US tech companies key asset for America; break up strengthens Chinese companies. Requires consent - done a little bit, now doing more in Europe and around the world.